The current transit plan leaves a lot to the imagination. The current plan for SmartTrack from the City of Toronto. Image via smarttrack.to. This fall, Metrolinx and Toronto city planners began consultations with community stakeholders and the public about SmartTrack. City Council will soon be asked to approve funding for the next stage of project development. Now that we’re starting to get into the finer details of the project and make decisions about how and whether to move forward with it, it’s time for the proponents of SmartTrack to answer some of the tough questions. 1. Why are we building something that will reduce ridership? The consultation meeting I went to provided no information about ridership. Ridership is usually one of the first elements used to build a case for new transit. There’s not much of a demand case for SmartTrack. This has been a problem all along. SmartTrack has moved forward without its supporters discussing, or even apparently taking an interest in, how many people will ride. I reviewed the overall ridership numbers for SmartTrack a year ago, and a station-by-station ridership analysis has been provided by Steve Munro here and here. In the 2014 campaign, mayoral candidate John Tory introduced SmartTrack as “London-style surface rail subway that moves the most people in the shortest time.” SmartTrack does not deliver on that promise. The ridership projections for SmartTrack are weak. Electrification reduces travel time by 15 per cent to 20 per cent. But the addition of new stations slows the trip by two or three minutes per station. And that loses riders. In the business case submitted to Council in June 2016, the City estimated that the SmartTrack stations added to the GO-RER plan would attract about 8,000 riders a day, which is a pretty tiny impact for the money. While GO-RER is expected to have a positive impact, the SmartTrack stations are expected to reduce its benefit. Looking at two scenarios of either four to five or seven to eight SmartTrack stations, the business case concluded “for both options, the disbenefits outweigh the positive benefits,” because slowing the travel time of the line with new stations would lose more passengers upstream than the line would gain. And that was the best case scenario, where passengers could ride GO trains for TTC fare, as Tory promised. Unfortunately, that is unlikely. Building new transit is not supposed to come at the expense of existing riders. Even at the stations where the new city ridership is going to be a net gain, there is still an expected loss of suburban riders. If I had to choose who takes transit instead of driving—someone who lives 30 kilometres from downtown or someone who lives 10 kilometres away—I’m going to choose the one going the greater distance because the contribution to pollution and congestion is greater with every kilometre behind the wheel. So why are we kicking them off the train to give a new, more local rider a seat? That local rider has other transit options with the TTC. Suburbanites who stop taking GO Transit will get in their cars. SmartTrack is actually taking us backward. The plan for SmartTrack as released by mayoral candidate John Tory. Image via smarttracker.ca. 2. Why do we continue to allow SmartTrack to jump the queue ahead of transit projects with better foundations that will provide better value? I don’t know for a fact that SmartTrack was dreamed up on the back of a napkin purely as something to be sold on the campaign trail. I do know that it wasn’t designed by anyone who knew anything about how transit actually works. 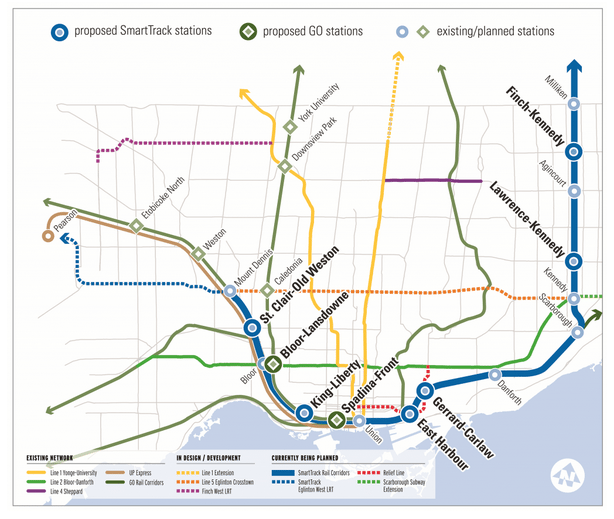 The first map of SmartTrack presented to Toronto was a line running mostly along existing GO Transit lines, from Unionville in the northeast to Matheson/Corporate Airport Centre. The last section would turn sharply west at Mount Dennis and run on a new heavy rail to the airport. Those who do know something about transit immediately pointed out that the plan for the Eglinton West branch was unfeasible. Rob Salerno pointed out that some of the land needed was already designated for new condo development and that many existing houses in the Mount Dennis area would have be demolished. Tory’s campaign danced around these obstacles by suggesting tunnelling—the most expensive component of transit infrastructure—was a possibility. Steve Munro pointed out tunnelling was not a good answer, that it would not be possible for a train to make such a sharp turn, and there were grade issues to consider as well. These serious problems were identified before the election. That Tory has since retreated from the Eglinton West part of his plan and restored the old idea of the Eglinton Crosstown LRT continuing west towards the airport is not the point here. The point is the SmartTrack plan had easily identifiable, insurmountable flaws when it was introduced. It was still in the napkin design stage. It was a whim, not a plan. The top transit priorities identified in 2013 by the planning department were: relief line (and extension), Scarborough-Malvern LRT, Sheppard RT, Waterfront Transit East and West, Eglinton LRT East and West extensions, Jane LRT, and Steeles BRT. These were identified after extensive study and consultation. None of them is a hunch or a guess or a whim. SmartTrack does not merit investment ahead of any of them. Poor ridership numbers, at great expense, for a project that was developed by a campaign with no serious work to back it up. Why should this be in the list of transit priorities for Toronto? 3. How are we going to pay for SmartTrack? During the campaign, Tory said the project would cost $8 billion, of which he estimated the city would have to contribute one third, or $2.67 billion. He asserted that this could be covered by Tax Increment Financing (TIF), which he claimed would generate $2.5 billion over 30 years—a higher figure than the use of TIF as a sole strategy had ever raised. TIF works by reserving the tax revenue from new development to repay the debt. California introduced the use of TIF in the 1950s, but in 2011, California governor Jerry Brown legislated it out of existence. New development brings new revenue but also new costs, and the TIF tax diversion meant schools and fire departments and sewer systems didn’t get the extra revenue they needed. TIF only generates meaningful revenue when the area being redeveloped is a wasteland, a drain on resources. This is not the case for any of the areas where SmartTrack stations are proposed. Here’s another problem with TIF: it does not work in a context of low property taxes. You can’t propose TIF as a serious revenue source and keep property taxes down at the same time, as the mayor proposes to do. It is true that SmartTrack is now a smaller project than what was initially proposed, as saner individuals have come in and shone a hard light of realism on the plans. The six stations the City is currently endorsing now carry an estimated price tag of $1.25 billion. Nevertheless, it’s still a big and expensive project. And because we have attached the label “SmartTrack” to some stations that were already in the RER plan, the City is now paying for infrastructure the province had already committed to cover. The proponents of SmartTrack need to explain to the residents of Toronto how they justify spending more than $1 billion for a project that will help very few people and make the commute of many others worse. Where are we going to find the money? Why should we prioritize such a weak plan? And why would we ever spend billions of dollars to reduce transit ridership?